Automatic, right angle, shrink bundler rated 10 to 20 bundles per minute – depending on materials, application and machine configuration. 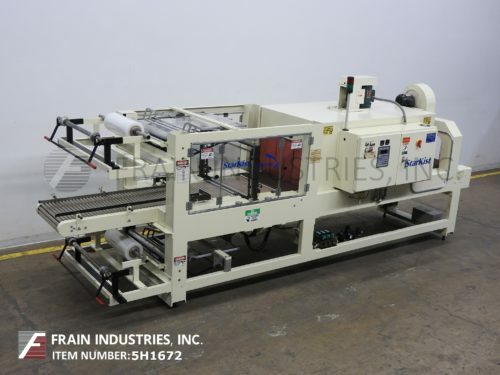 Equipped with a 10" wide x 60" long stainless steel powered roller infeed conveyor, product pusher, 29" wide seal jaw with 12" of vertical travel, top hold down, and two 5" wide x 16" long transfer conveyors to a shrink tunnel. Tunnel dimensions: 33" wide x 15" high aperture; 100" in Length. Equipped with a 26" wide x 144" long mesh conveyor belt, top center blower, rear cooling blower, and two side compression rollers. Additionally features an A/B PLC and variable temperature and speed controls.